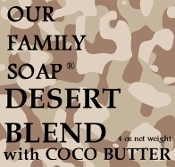 Our basic soap combined with coco butter , Patchouli, Lavender and Sandalwood EO blend. An exciting but yet a soothing scent. *Created originally for a member of our Armed Services going to the Middle East. 4 oz bar. A combination of olive oil, coconut oil, palm oil, sodium hydroxid (lye, neccesary for soap making), coco butter, Patchouli, Lavender and Sandalwood EO blend and Vitamin E.
*True Story: One Saturday a young lady came to our booth at the Webster Street Market and asked if we made custom soaps. She was being deployed to Afghanistan and did not want to use the local soap. We made an entire batch of 26 bars to her request. We liked the combination so well we asked her permission to add Desert Blend to our line. She picked the name and we use the desert camo to honor her service to our Country.